Everyone is out doing their Christmas shopping so I thought it might be helpful to put together a gift guide of what to buy the women in your life if your stuck for ideas. This gift guide will be helpful internationally but more useful for my Aussie readers because the links take you to Australian websites and I can't be positive these exact sets are available overseas. 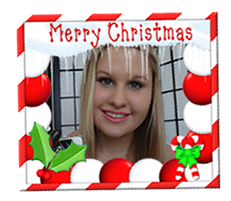 If your a mum and don't know what to get your daughter, any beauty sets I am sure she will love. 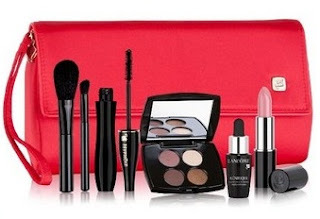 I blogged about the MAC Holidays Sets in October, a bit before they came out, which you can read about here so I decided to not mention any of those sets in this gift guide but they are also a great gift idea. This Benefit set contains Hoola Bronzer, Some Kinda Gorgeous, Mini BADgal Lash mascara and Mini deluxe High Beam. 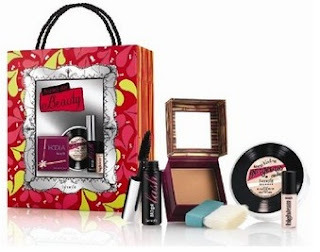 Benefit came out with another set similar but I thought this one was the best option and comes with more useful items. Click here for prices and more details. I love buying gifts for my gran and something I think all older women love is creams because our skin becomes drier as we age so grandmothers appreciate moisturizing products. I actually think this is what I am going to get my gran for Christmas this year and it is the Jurlique Lovable Skin Rose Essentials set which contains Rose Hand Cream 125ml and Rose Love Balm15ml. Click here for prices and more details. I usually end up spending the most on my mum for christmas and it is usually buying a makeup set. I personally love giving makeup sets as gifts because usually sets contain a product for every aspect of beauty and this Lancome set is no exception containing brushes, mascara, eyeshadow, skincare and lip products. Click here for prices and more details. I am always hesitant to gift perfume just because it is such a personal thing as I elaborated more on this in my how to find your signature scent post. 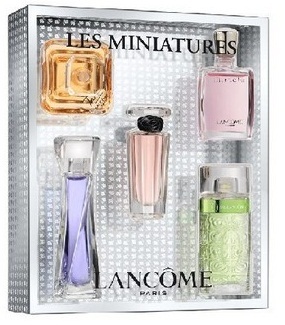 However, I love the idea of this Lancome perfume set because it comes with a variety of mini's which your older sister can try out and see if she especially likes one and wants to purchase the full size. The scents in this set include Hypnôse EDP 5ml, Trésor EDP 7.5 ml, Miracle EDP 5ml, Trésor In Love EDP 5ml and O de Lancôme EDT 7.5ml. It is great to receive things like this as a gift because you wouldn't ordinarily buy this for yourself. Click here for prices and more details. 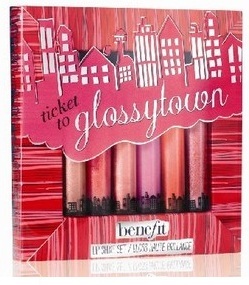 So if your buying for multiple friends you may want to look into something a little less expensive but for a really good friend you want to splurge a little bit on, I think this Benefit Ticket To Glossytown Set is super cute and a great way for your bestie to try out different colours and see if she might be interested in purchasing a full size. Similar to the Lancome Perfume Set, you typically wouldn't buy something like this for yourself so it's great to get it as a gift. If your sister is really young like mine, between like 3-6, plastic colourful jewellery always manages to put a smile on their face and is usually really inexpensive (This set is only $13!). 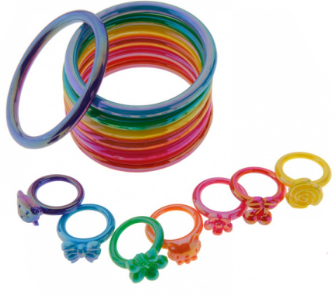 It is a girly way of introducing them to jewellery and giving them bracelets and rings they will appreciate and use but not going over the top with fancy pieces. Click here for prices and more details. This is just an example I found but there are so many other options for this gift out there. So it may be really stressful and difficult thinking about something to buy your girlfriend! There is a lot of pressure to find something quality, memorable and meaningful but still reasonably priced. Rings never fail to make a girl feel special and loved but they don't have to be expensive!! 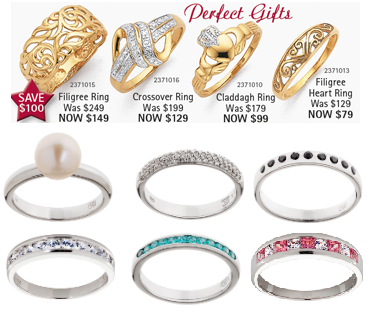 The first picture is taken from the latest Prouds brochure and are such good quality but all under $200. The second picture of the 6 rings are examples taken from the Wallace Bishop website and are all under $100! Click here for prices and more details. I hope this was helpful for anyone stuck of ideas on what to buy the women in their life!